A popular HR strategy where companies move around their employees to different kinds of jobs inside the organization for the benefit of the employer as well as employee is called job rotation. Job rotation has been designed to increase the level of motivation and interest level among employees. Despite having several benefits to skill development, job rotation is needed more than employee training. For this kind of change in work procedure a simple job rotation training is also needed by an employee for effective productivity. A job rotation program can be understood as a proper and most effective tool for understanding employees. It is used by most HRs as a strategy and is about settling all employees in the right place where they will be able to deliver the best results. In the high world that we live in, it could be proven as one of the best strategies to find the replacement of employees from inside the organization. Getting hold of the suitable ones and shifting them to take over other responsibilities is also a tough challenge. Job rotation policy will help all HR managers to see who may be replaced and how can he be a beneficial fit. The following mentioned are few benefits of job rotation process in organizations. Job rotation has been designed in such a way that it easily exposes all those employees to a much bigger and wider range of operations so that it can assist the managers in understanding their talents, especially those that are hidden. In that process, they have also kept away from a whole range of assignments so that they can gain more awareness about the style of working of the organization and also understand the problem clearly which crops up at every single stage. By using that process, managers will identify what an employee is good at and what according to he or she is given a task. The employees are not much aware of what it may look like to do until they have laid their hands on a specific job. If the job happens to be rotated or maybe if they have been exposed to other different operations, they may also identify what they are really good at and what they could be enjoying. Whenever there is a job rotation, the employers have a new opportunity to see what employees are all about and that is what helps them understand their hidden potential and talent. Job rotation will help all managers and individuals to identify their knowledge, attitude as well as skills. It may be used to see and determine who needs to upgrade their skills in order to give a better performance. It will also help in analyzing the training as well as the needs of development by the employees so that they can have even better output. When employees have been exposed to different kinds of jobs or have been assigned with new tasks, you must try to give them their best while dealing with them effectively in the challenges that come their way. Also, it encourages the employees to do an even better job at every single stage of their life. This was definitely in the past improved and given rise to a healthier competition inside the organization where everyone wants to do a better job than the others. In short, job rotation is motivational and extremely helpful for most employees. When employees expose themselves to different tasks and functions, they tend to boost their level of satisfaction. Job variation is something that reduces the boredom of doing the same kind of task every day. Moreover, it also decreases the rate of attrition of every organization. The employees also develop a sense of belonging towards the organization and always stick with it till very long. The alignment of competencies with requirements also means directing such resources when and wherever they are needed. It will also assess the employees as well as place them at the point where the competencies, caliber, and skills will be used to the highest extent. That is definitely one of the biggest and most powerful benefits you can get with job rotation. In every organization especially banks, job rotation is taken so that employees will not be involved in any kind of fraud activities. For example, if a person has been handling some assignment or a job for a long period of time, he will surely be able to find the loopholes inside the system and use them for indulging as well as benefit in the fraudulent practices. Therefore, job rotation can be used as a fast and effective technique to keep them away. A whole lot of time and effort is wasted in persuading employees and motivating them for job rotations. You should never expect your team members to work willingly with people belonging to different departments whom they don’t know at the first attempt itself. Superiors will have to sit with every individual in person and talk about the benefits of job rotation and explain to the person why they should work on this. Convincing the employees for job rotation can often be a little time-consuming. Being a boss it will be hard to concentrate on any work but you must encourage your juniors to say yes to job rotations. A common disadvantage that comes with job rotation is that individuals tend to take up a lot of time to get acquainted with the new process. They expect miracles out of professional and that makes the whole process foolish. How can sales professionals know every single thing related to accounts or even the software which is used by the IT team in just a day? Work does suffer towards the end of the day and it stops the organization from functioning normally. Employees feel very stressed out and anxious during such periods. They are expected to step outside their comfort zone and end up not contributing enough in other departments. From them, the job rotation happens to be a process or some sort of formality. They are genuinely not interested in that. Individuals do not tend to open themselves up in front of new people. When it comes to having new colleagues, they find it very hard to just adjust and create all kinds of problems. Another problem that comes with job rotation is that it doesn’t check the amount of time that has been wasted in training those who are not worth it and those who don’t really deserve to be within the system as well. Once picked the wrong kind of people for job rotation, it creates a danger of misuse of information of other departments as well as their data. If someone has been volunteering for it willingly, the company will have to give them the opportunity. Anyone who has been denied of that would speak bad about the organization and eventually lose all interest. It is hard therefore to find people who are deserving of this. The final disadvantage that comes with job rotation is that there are no results towards the end. People end up learning after being shifted to a new department. It doesn’t help them in any way get better and obviously, that doesn’t help you either. 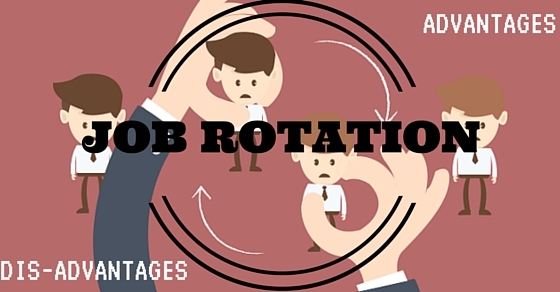 Finally, here are some of the popular misconceptions people have regarding job rotation. Keep reading to find out what they are! One of the biggest misconceptions regarding job rotation is that it is quite easy to design. Effective designing happens to be the most difficult and vague aspects of job rotation programs nowadays. The sequence of rotation, as well as frequency, must be based on the evaluation of the specialist as well as the other job factors which include the muscle groups that are used, postures, forces and repetition. The skills and training requirements must not be left out. Even though it is true that job rotations are a hard sell in today’s world, the benefits of doing job rotation may exceed the costs at times. The employees, as well as managers, are going to accept the program which is provided and fully understand all the benefits that come with job rotation. This includes the upper management as well. They are also fully committed towards that. This brings the post to an end. If you have liked reading the article and found some benefit from it, please do let us know in the comment box below. Always remember that job rotation is tough, needs a lot of understanding but comes with plenty of benefits. It also has its cons like everything else. If you have some questions regarding the article, do let us know as well. On that note, good luck.